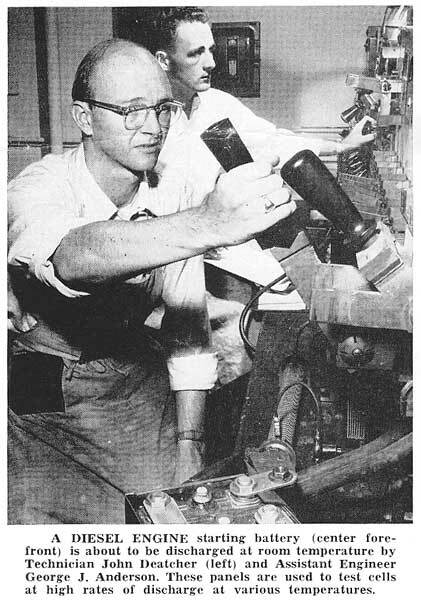 One of the most fascinating sights in the great Sonotone research laboratories at Elmsford, NY, is the making of tiny vacuum tubes used in hearing aids and amplifiers. These miniature tubes look as if they were intended for a radio in a doll-house, but for thousands of people they have been the means of tuning in anew on a more active life. This laboratory is the largest in the world devoted exclusively to making vacuum tubes for hearing aids. 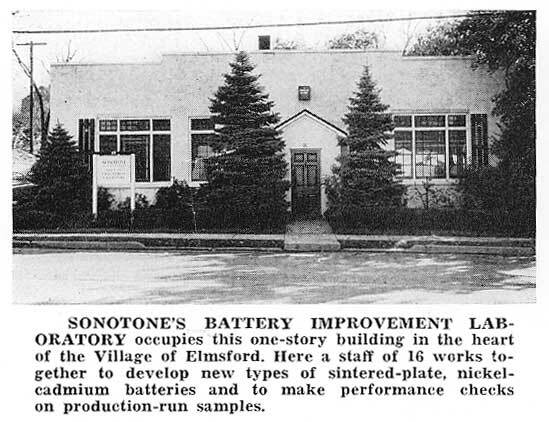 By the 1950's Sonotone was making over 400 different tubes. They were popular receiving tubes ranging all the way from 0Z4 to 7199's. They also sold European EL, EM, EZ etc. In addition, there were special purpose tubes made for the Signal Corps at Ft. Monmouth, New Jersey. 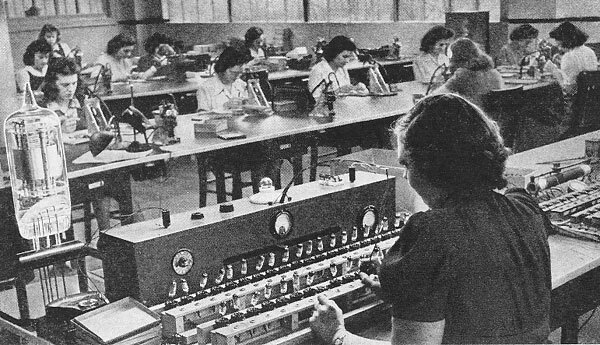 The automated tube manufacturing equipment was located at the Elmsford factory. The progressive line was circular, about 20 feet in diameter. There were many gas jets at each step to heat the glass and shape it. It was very impressive to watch. 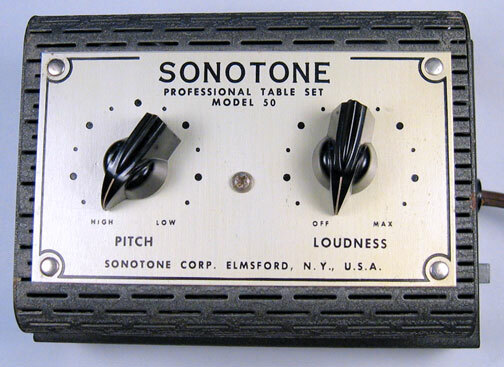 Some of the tubes were made by other manufacturers with the Sonotone name on them. Some were made by Telefunken, Mullard and Amperex. An economy line was later introduced with tubes made in Japan and were sold in green boxes. 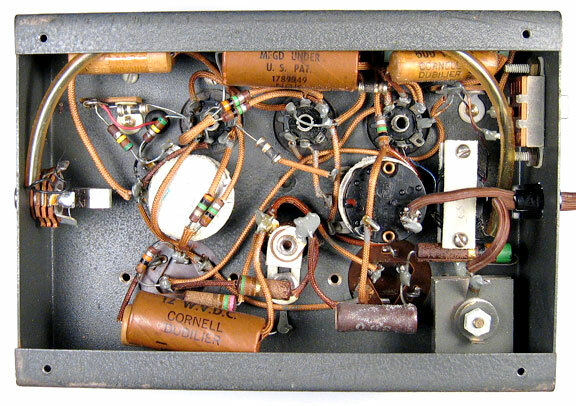 By the mid-sixties, tube sales decreased with the advancement of transistors. The tube manufacturing equipment was sold, and hearing aid production was moved from Main Street in White Plains, a few miles away, to the Elmsford plant. This is a later model used for Orin Marvel’s Oragraph Process that improved the hard of hearing.. It is much smaller and simplified with later technology compared to the original version. When the top cover is removed, the various parts can be seen. There are two 1U5 tubes that comprise the oscillator circuit and one 3Q4 tube for the output. 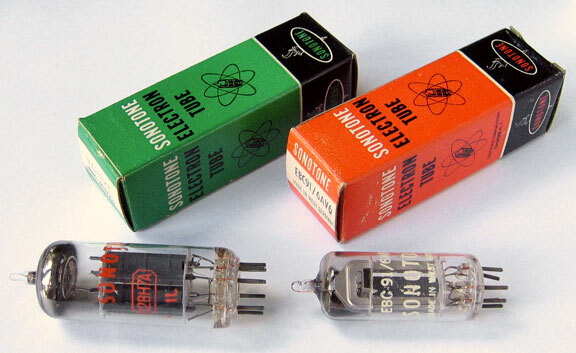 These tubes are very low power commonly found in portable tube radios. However, the unit plugs into a regular 120V AC outlet. A 7-watt ballast lamp is at the top center and is painted black, probably so it would not disturb the patient. A small speaker is mounted vertically shown at the bottom left. Filter capacitors can be seen near the top of the picture. With the bottom cover removed, the remaining parts can be seen. A selenium rectifier is at the bottom right. A phone jack is located at the left side for connection to a headset or bone conduction unit. 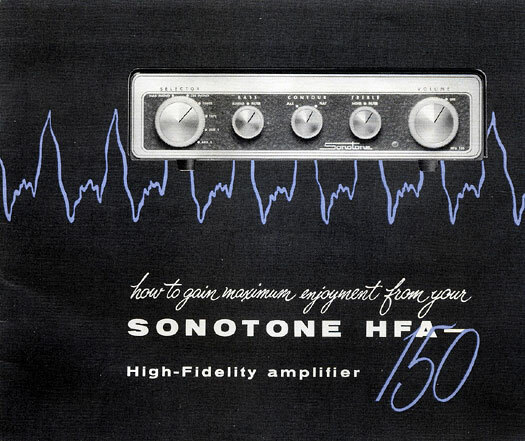 In 1956 Sonotone made the HFA-150 tube Hi-Fi amplifier. This is monophonic and has 12V6's for the output, producing about 12 watts. It is very compact, nicely styled, and measures 3-1/2" high, 12" wide and 8-1/2" deep. The selector switch on the left has positions for magnetic phono, ceramic phono, tuner, tape, aux 1 and aux 2. The center control is a continuously variable loudness contour. To the left and right of the center control are the bass and treble controls. If the bass control knob is pulled out, a rumble filter is switched in. If the treble control knob is pulled out, a noise filter is switched in. The right hand knob is for the volume with an on-off switch. A red power light is located near the volume control at the bottom. Tubes are 2-6AN8, 2-12V6 and 1-12BW4 rectifier. DC filaments were used for the 6AN8’s. The front panel was available in tan or green color. It weighs 12 pounds. The rear panel has inputs for tuner, ceramic phono, tape, magnetic phono, aux 1 and aux 2. Level adjust controls are provided for tuner, tape and aux 1. A tape output is located at the center. Screw terminals are furnished for an 8 or 16 ohm speaker. An AC outlet is also provided. The fuse is 1.5 amps. 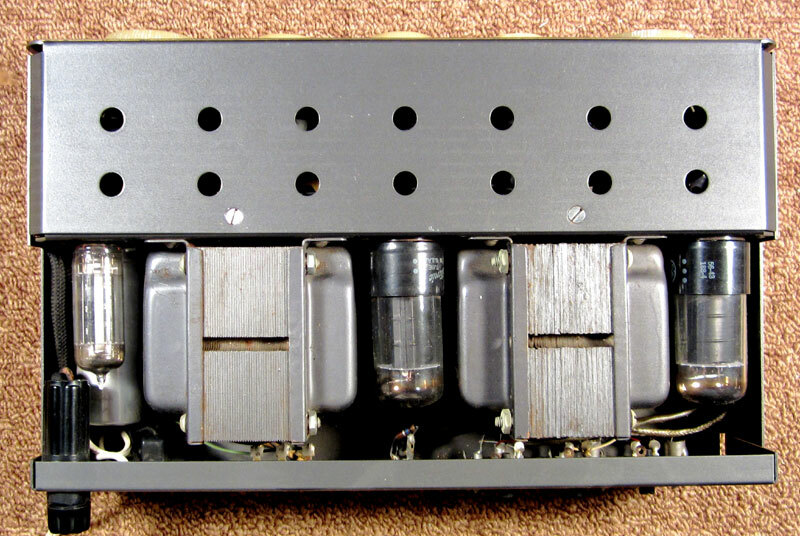 These amplifiers were sometimes used at the Hi-Fi shows, but were found to be unreliable, caused by a faulty output transformer. As far as I know none were ever sold. 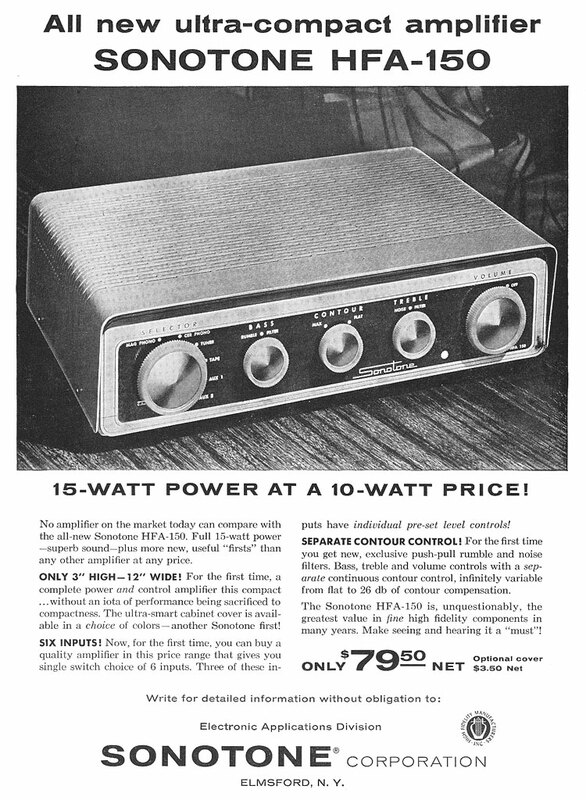 A Marantz 8A amplifier and preamplifier were used thereafter for the Hi-Fi shows. After removing the cover, a pictorial layout can be seen on one side. The major components can then be located. To gain access to the smaller parts, two screws in the top and three screws in the bottom must be removed. Then the front panel can be folded down. A grounding bus can be seen in both upper and lower portions. An 18-page manual was included. It is 18 pages and has a detailed description of the controls and how to use them. It also has a complete schematic and parts list. The manual is 8-1/2” wide and 7” high. The HFA-150 was advertised in the April 1957 issue of High Fidelity magazine, page 22. "Compare this Sonotone HFA-100 for both performance and appearance with any amplifier you can buy-at any price! Its 12-watt output is ample for the largest living room. Frequency response is flat beyond audible limits, at any volume setting. At normal listening levels distortion is virtually unmeasurable, and only 0.15% at maximum! Hum and noise, too, are completely negligible. Cabinetry is equally superb-either solid mahogany or solid walnut; the panel, softly glowing solid brushed brass. Picture this unit conveniently at your chairside...its beauty is at home in any home. The HFA-100 is for use with fine ceramic phono cartridges, tuners, tape recorders and television. 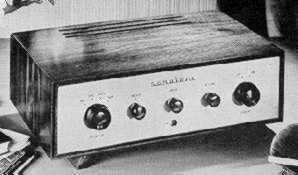 If splendidly reproduced, noise-free music is your interest, rather than gagetry and knob turning, here is the amplifier for you. $117.50 ($99.00 less cabinet)"
"Similar in appearance to the HFA 100 above, this CU-50 is a self-powered control amplifier designed to work with any power amplifier. Used with ceramic phono cartridge, tuner, tape, or television sound, the CU-50 gives you complete chairside tone, volume and selector control, for relaxed listening pleasure. $59.00 ($49.00 less cabinet)." The cabinet size is 4-1/2" high, 11-3/8" wide and 6-1/4" deep. At the left is the Sonotone RH-4 and EH-4 quarter track record/play and erase heads. Sonotone also made 1/2 track mono heads. These competed with other manufacturers such as Michigan Magnetics, Shure and World. The 1/4 track heads are made in two identical sections. Extremely fine wire is used to wind the coils on U-shaped magnetic cores. Each half contains a coil wound on a core, a copper plated inter-channel cross-talk shield, adjacent channel keepers for minimization of "long wavelength" cross-talk and two standard .052" pin connectors. The record head gaps are 80u inches (0.000080"). The head magnetic circuit is a balanced "hum bucking" arrangement. This, combined with the internal shielding, gives the head extremely low sensitivity to hum fields. The EH-4 erase head is also made in a similar way. A double gap construction has laminated core elements in the magnetic circuit giving high efficiency erase and minimum temperature rise. A heavy copper shield plate the full width of the inter-channel space separated the two erase circuits and gives excellent channel erase isolation. The heads were ground and polished in a lapping operation. An inductance bridge was used to monitor the lapping until the required inductance was reached. The heads were tested for constant current characteristics, reproduce characteristics, co-alignment, and cross-talk. 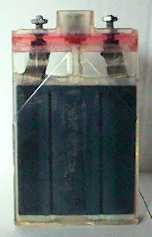 A standard RCA test tape was used. Tests were made using a Berlant tape deck that could accommodate several heads at one time. Test fixtures allowed heads to be rapidly inserted and aligned. Heads were aligned with an Ampex standard alignment tape. A Hewlett-Packard 200CD oscillator was used for a bias frequency source. This was connected to a McIntosh MC-30 amplifier. 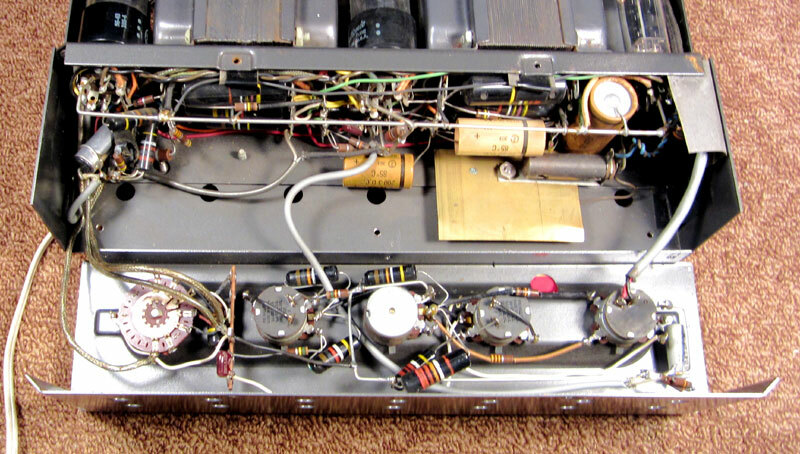 The 600 ohm output from the McIntosh amplifier drove a flyback transformer and RC networks that connected to a record or erase head to be tested. 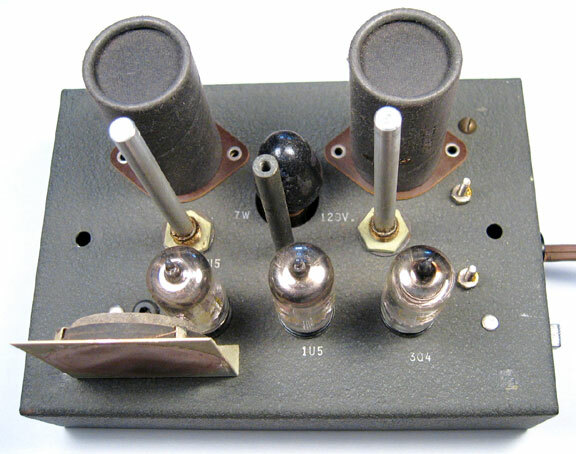 A general Radio 1304B oscillator was used as the audio source. It was chain driven by a Sound Apparatus chart recorder for automatic measurements. 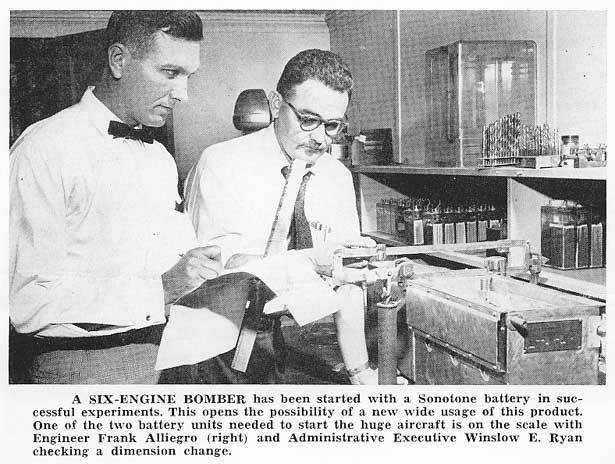 Sonotone also became interested in rechargeable batteries to power the hearing aids. They were able to get possession of the data from Germany where the nickel cadmium battery was being developed during the war. They also established a quality team of technical personnel to study the internal chemistry and perfect manufacturing techniques. At first, this was only for the larger vented wet cell batteries and was not useable in hearing aids. The nickel cadmium, or Nicad, battery offers several advantages. It is lighter than a lead-acid battery. It can be recharged very rapidly. Typically, when used in aircraft, the Nicad batteries would be charged before the plane left the runway. Nicad batteries could perform such feats as being frozen in a block of ice, yet start a car. A set of 10 D cells connected in series with heavy wire could also start a car. The reason is that the batteries have extremely low internal resistance, allowing them to deliver large amounts of current. Employees were required to remove rings and other metal items when working around them. A Nicad battery pack could easily vaporize a ring if it was accidentally placed across the terminals. A nicad cell produces 1.25 volts compared to 2.0 volts for a lead-acid cell. Ten cells are required for a 12.5 volt pack instead of six for a lead-acid pack. The electrolyte in the nicad is potassium hydroxide, completely opposite to sulfuric acid found in lead-acid. If acid is accidentally added to a nicad cell, it will explode on contact. The output voltage of the nicad remains relatively constant through most of the discharge and then decreases rapidly at the end. A typical cell is shown above. It's made of clear plastic. A red dye is used in the cement to check for voids when the top and bottom pieces are glued together. The stainless connecting terminals are at the left and right. The center neck is for filling. A hollow stainless screw with a hole on the side is used in the fill hole. A rubber cylinder fits over the screw to seal it. Because these cells can be rapidly charged, a vent is required to relieve the build-up of gasses in the cell. They can escape out of the screw hole and under the rubber. I do question this 1955 picture. I think this may be George Anderson on the left but the person on the right does not look like John Deatcher. When I started there in 1959, John was working in audio products and testing tape heads. I also think he was much younger looking. The battery at the right is a typical sealed cell. This is a type S108-size F cell. On the front it says "Sonotone sintered plate Nickel-Cadmium battery, 1.25 Volts rechargeable". On the back it has the model number and the recommended charge rate at 600 MA for 16 hours. The battery is 1-5/16" in diameter and 3-1/2" long. It weighs 224 grams, or about 8 ounces. There are also two patent numbers on the back. Patent number 3,081,367 was awarded on March 12, 1963 to Harold Field, Peekskill, NY and Mary Daria, Elmsford, NY, assigned to the Sonotone Corporation, Elmsford, NY. 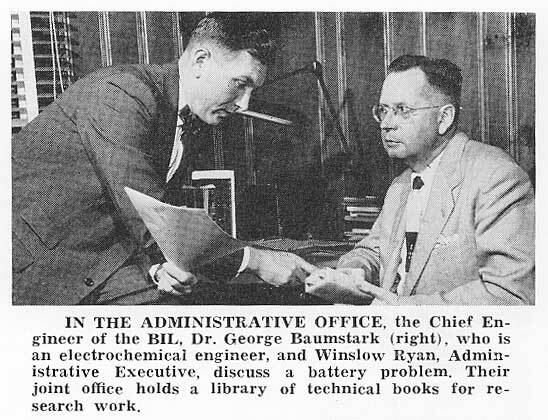 It was filed on May 10, 1961 and is titled Electrode Assembly for Sealed Rechargeable Alkaline Battery Cells. Patent Number 3,083,249 was awarded on March 26, 1963 to Louis Belove, 29 Overlook Road, Ardsley, NY. It was filed on December 18, 1959 No. 860,609 and is titled Coilable Sintered Electrode Plate for Alkaline Storage Battery and Coiled Electrode Assembly Formed Therein. 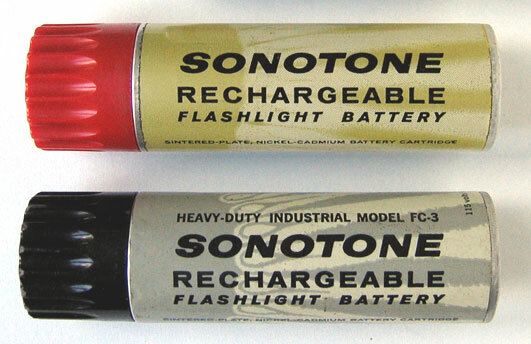 In the early 60's Sonotone developed a rechargeable flashlight battery that could replace two D cells, end-to-end. Although the voltage of the two cells adds up to only 2.5 volts, they could produce a bright light in temperatures ranging from minus 40 F up to plus 165 F. They could retain 50-70% of their charge after 6 months. The complete charging unit is incorporated in the cartridge. The cap can be unscrewed and plugged into a 110-120V AC outlet. Charging time is 16 hours. In 1961, the FC-2 sold for $7.95 and the FC-2 sold for $9.95. The patent number is 2,708,211. A 5-year warranty card was included with each battery. The batteries could provide at least 3 hours of strong, continuous light from a single charge with a PR-6 bulb—or 1-1/2 hours with a full-powered PR-2 bulb. It could be charged hundreds of times at about ¼ cent per charge. It was sturdy, leakproof construction—aluminum jacket—electrically shockproof. 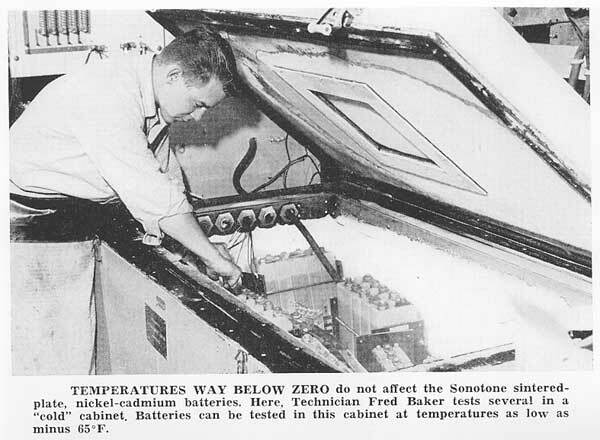 These rechargeable batteries were advertised in several magazines, one was in the PF Reporter, May, 1960. By the late 60's, competition became very intense and Sonotone batteries were discontinued. 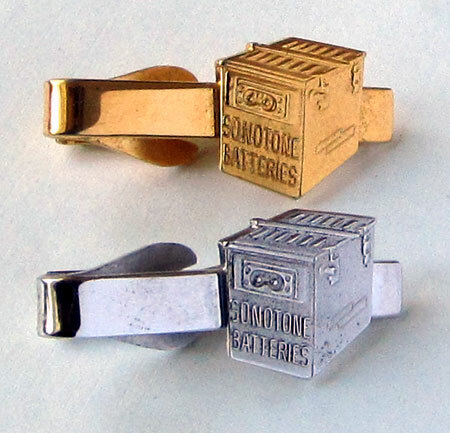 A promotional tie clip was available in either chrome or gold finish. More text and pictures about Sonotone will be added as my research continues. Any comments, corrections, or additions are welcome.